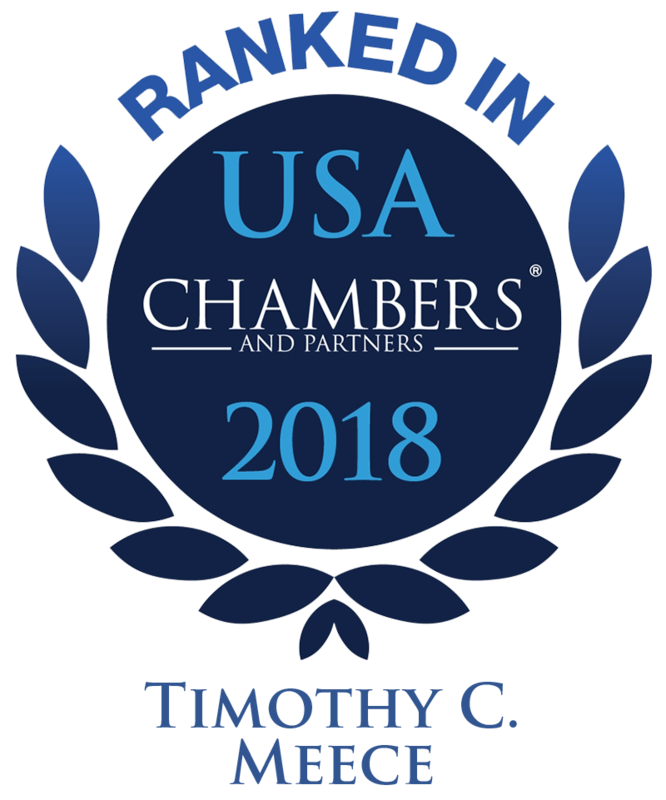 Timothy C. Meece is a principal shareholder in the Chicago office of Banner & Witcoff and has over twenty years of experience litigating and trying complex intellectual property cases. His reputation as an effective and winning first-chair trial lawyer has been earned representing both Fortune 500 companies and small clients in intellectual-property infringement lawsuits in district courts throughout the country and in inter partes reviews (IPRs) in the Patent Trial and Appeal Board in electrical, computer hardware/software, mechanical, and chemical arts, and also for copyright infringement with respect to computer software. He also handles trademark proceedings before the Trademark Trial and Appeal Board. He has represented clients in numerous jurisdictions including California, Delaware, Florida, Georgia, Illinois, Kentucky, Massachusetts, Michigan, Mississippi, Nevada, New York, Ohio, Oregon, Pennsylvania, Puerto Rico, Texas, Virginia, Wisconsin, and the U.S. International Trade Commission. Mr. Meece has been named to the 2019 edition of the Best Lawyers in America and featured in the National Law Journal’s “Intellectual Property Hot List” of the top 20 IP firms in the U.S. He has also been featured as a “Legal Lion” for his successful representation of Lexmark International, Inc., in, Law360′s “Weekly Verdict: Legal Lions & Lambs.” In addition, he has been recognized repeatedly in intellectual property law as well as in commercial litigation by Chambers USA, Managing Intellectual Property, Intellectual Asset Management, Martindale-Hubbell™ (AV LexisNexis® Martindale-Hubbell® Peer Review Rating), where he has a 5.0 out of 5.0 rating for peer and client reviews, American Lawyer Media, Chicago Magazine, Illinois Super Lawyers, Illinois Leading Lawyer’s Leading Lawyers Network, Who’s Who Among Law Professionals, and Who’s Who Among Executives and Professionals. He is listed as one of the top 3% of attorneys in the United States by The Legal News and was named in IAM Strategy 300—The World’s Leading IP Strategists as an individual who offers “world-class services relating to the development and implementation of strategies that enable IP owners to maximize the value of their intellectual property portfolios.” He has also been a winner of Corporate LiveWire – Global Awards in the field of IP Litigation. Mr. Meece has won on behalf of multiple defendants facing potential liability of hundreds of millions of dollars. He recently won a General Exclusion Order for Lexmark International Inc. in one of the largest ITC investigations ever initiated which, according to the Office of Unfair Import Investigations, involved assertion of an “unprecedented” number of patents. On behalf of intellectual property owners, he has won many judgments/settlements in the range of $10 million-$100 million, temporary restraining orders, preliminary injunctions, permanent injunctions, and orders for contempt for violations of permanent injunctions. He has also successfully defended more cases brought by non-practicing entities against his clients than most attorneys in the country. Mr. Meece is also an FAA-approved instrument-rated commercial pilot as well as a PADI Master Diver. Please contact Mr. Meece directly for a complete listing of articles and publications authored by him, his press interviews, his bar association memberships, bar committee assignments, and adjunct professorships as well as other teaching activities. 03.02.2018 | Timothy C. Meece presents “Patent Exhaustion and Lexmark” at 13th Annual Advanced Patent Law Institute in Alexandria, Va.
09.11.2018 | Patent Exhaustion in View of Impression Prods., Inc. v. Lexmark Int’l, Inc.
12.04.2009 | Is TS Tech the Death Knell for Patent Litigation in the Eastern District of Texas?